Darin surprisingly sang four songs at last night's Allsång På Skansen. Watch performances of "Ja må du leva", "Ta mig tillbaka", "Runaway" and "Breathing Your Love" right below! 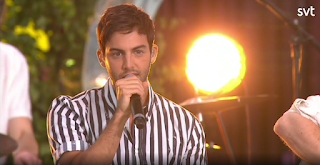 After 2 years, Darin is making his comeback to one of the most watched summer shows in Sweden: Allsång På Skansen. Two years ago, he performed "Ta mig tillbaka" and "Juliet". Is he going to premiere a new single, the second one off his new album that is expected to be released in October? The show airs live tonight at 20:00 CEST on SVT Play. You can stream it live on the SVT Play app or at this link.